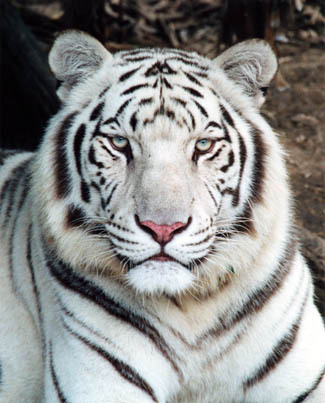 White tigers are in fact, bengal tigers, but instead of orange and black coloring, they're white with black stripes. Contrary to popular belief, they don't come by their coloring naturally and are not a sub-species of tiger – they look the way they do thanks to a genetic defect. In the fifties, a male white bengal tiger cub was found in India which was eventually brought to the U.S. That male was bred at a zoo to an orange and black female which resulted in three litters of 'normal' colored (orange and black) cubs. Unable to figure out why the original male cub was white, he was then bred with one of his daughters from the litter of 'normal' colored cubs; that pairing produced black and white cubs. In essence, white tigers get their coloring from a double recessive gene. Many of those involved in tiger conservation are of the belief that mating brother and sister cats, etc. is dangerous and unhealthy for the animals since it seems the goal is purely to produce black and white cubs. Genetic defects are often a reality of of inbreeding, as is the case with any animal population where it takes place.